Do you feel nostalgia for the computer game Oregon Trail? 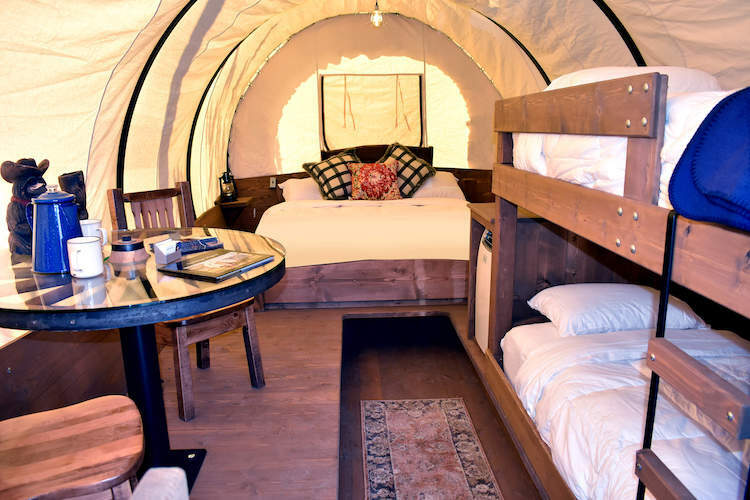 If you spent your youth wondering what it’d be like to live in a covered wagon, you’re in luck. 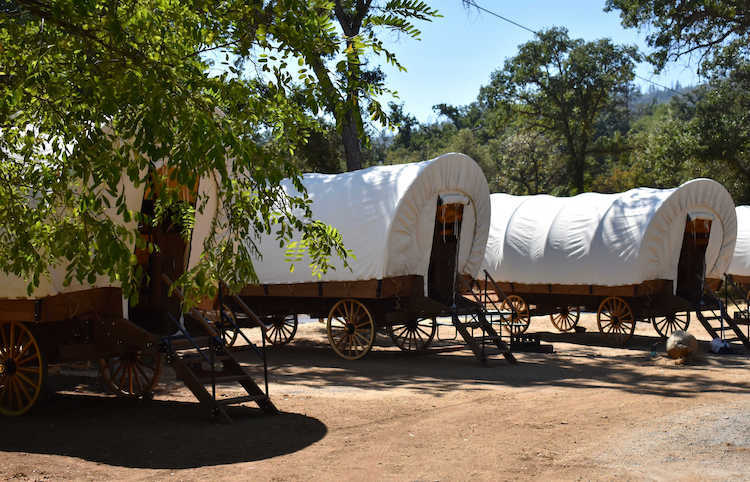 You can now channel the pioneer experience by spending the night in Conestoga covered wagons near Yosemite National Park. The Yosemite Pines RV Resort and Family Lodging have recently outfitted authentic caravans to appear rustic on the outside but a cozy glamping experience inside. 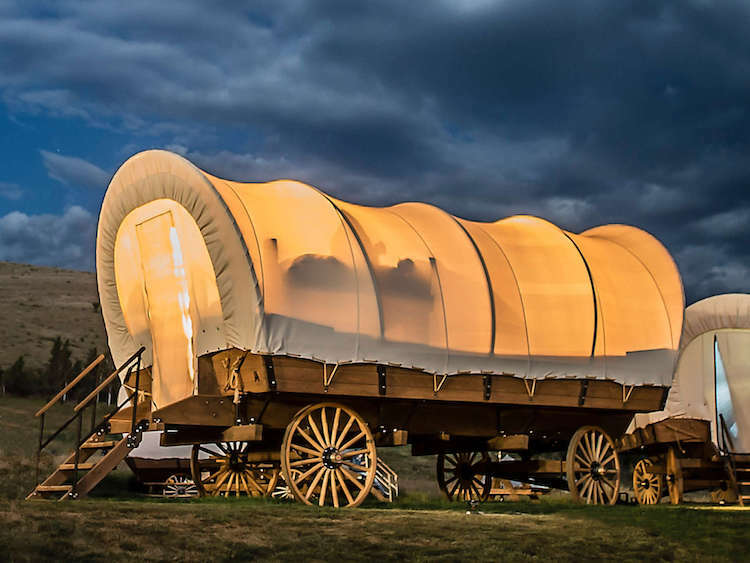 Operating as massive tents on wooden wheels, these covered wagons will make you feel like you’ve traveled back in time. But luckily for us, they offer modern conveniences that make for a comfortable stay. The accommodations can sleep between four and six people, and they are equipped with a king sized bed, a set of bunk beds, and a place to eat. You won’t be subject to the elements, either; every wagon has heating and air conditioning, along with a microwave, refrigerator, and Keurig coffee maker. Beyond the Conestoga walls, there is an outdoor area that provides a picnic table and a grill. In addition, the RV resort has a community swimming pool and volleyball courts—all in a stunning natural setting just 22 miles outside of Yosemite. The covered wagon trailers are available for booking with rates of $139 and $279 a night. Visit the Yosemite Pines website to try their version of pioneering lite. Have you ever wanted to live pioneer life? 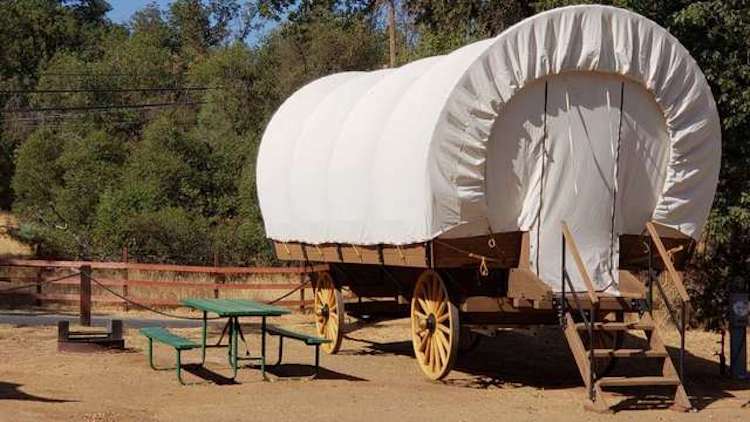 You can now try it (sort of) when you stay in the covered wagon trailers of Yosemite Pines RV Resort and Family Lodging. Each wagon sleeps between four and six people and features heating, cooling, and other modern conveniences. Best of all, the locale is close to Yosemite National Park—just 22 miles away. All images via Yosemite Pines RV Resort and Family Lodging. The post Try Living Like a Pioneer in These Covered Wagons Near Yosemite National Park appeared first on My Modern Met.